Once a less known field that student used to take up only when they didn't have any other option, Media & Mass Communication has reached a place today, where it should have been always. In this ever-connected world, when people from different parts of the world want to share their views and opinions with each other and know what's happening across the globe, a media professional plays a pivotal role. However, even in the present day, the mass misunderstands the role and duties of the media professional. This profession not merely is attached with gathering information and writing it down, it has gone beyond any kind of confinement. From mobile journalism to citizen journalism and social media journalism to community journalism, the horizon of journalism has grown in manifolds. Today, there is no end of mediums through which a particular message can be communicated to the public. Considering the power and ability of the media professional in reaching out to the common people in an effective manner and encouraging the national voice to be raised against any improper happening, a career in Media and Mass Communication has been given great consideration and preference among the youth. Coming out from the notion that only a career in medicine or engineering will fetch them a good stature in the society and reward them with a handsome salary, the new generation students even after earning exceptional grades in their 12th standard, are showing interest in pursuing a bachelors followed by a masters and doctoral programme in this emerging sector. Noticing the growing demand of this area of study, numerous institutions have blossomed up in recent years. Hence, to help the students to differentiate between the average and the best institute, we at the Higher Education Review have come up with the ‘10 Most Promising Media & Mass Communication Colleges in India – 2019’. The listing which has been compiled by our panel of researchers and experts comprises of Media and Mass Communication institutes that are unique in comparison to counterpart institutes in terms of having excellent faculty members, offering distinctive courses & quality education and ensuring blissful careers to their students. Amity School of Communication Noida, UP A premier communication institute under the Amity Universe umbrella, ASCO ensures to render a modern and sophisticated learning environment coupled with rich Indian heritage and value system. Creative Hut Institute of Photography Kerala Having seasoned and proficient in-house and visiting faculty members on board, Creative Hut Institute of Photography, managed by National Education and Research Foundation holds the pride of being India's first Photography Residential Institute. Goodness Institute of Film and Television Kochi, Kerela A one-of-its-kind institute, GiFT Cochin enrols students for a range of diploma courses in media related demandable areas with the vision of evolving into a centre of excellence, producing talented media professionals with strong human values. Indraprastha College for Women Delhi Conducting Bachelor of Mass Media and Mass Communication since 1999, the College today ranks among the top media schools in the country owing to the hands-on training and bright careers provided to the students. 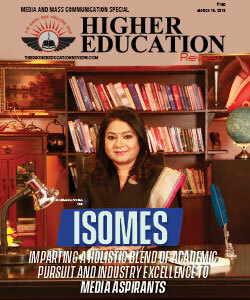 International School of Media and Entertainment Studies Noida, UP Instituted in 2010, ISOMES boasts on providing its students exemplary placement opportunities through placing them in reputed national Television Channels, Newspapers & Magazines and Media Houses. Kishinchand Chellaram College Mumbai, Maharashtra The College offers a specialized BA programme in Film, Television & New Media Production upholding the motto to develop creative temperament and mind set needed in the content production segment of media industry. Madras Christian College Chennai, Tamil Nadu One of the eminent College in the Southern India, the Department of Communication at Madras Christian College, welcomes students from all over the country for a Masters' programme in Communication. Symbiosis Institute of Media and Communication Pune, Maharashtra A leading media school in the country, SIMC is located in the mesmerizing Symbiosis Knowledge Village and offers MA in Mass Communication and MBA in Communication Management. The Department of Media Studies, Christ University Bangalore, Karnataka Offering Media courses right from UG to Doctoral level, the Department of Media Studies at Christ University is one of the most sought-after destinations among the media aspirants of the country.